FIREFIGHTING IS AN INHERENTLY DANGEROUS OCCUPATION. Firefighters are often exposed to dangerous conditions while performing duties of saving lives through fire suppression and emergency medical care. The goal of the Safety Division is to ensure the safety of all the firefighters and officers at East Pierce Fire and Rescue. This division provides a process in which safety concerns can be resolved. Staff also reviews and removes hazards that may become safety issues through hazard reporting. 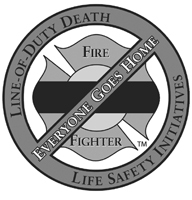 East Pierce supports the National Fire Academy’s “Everyone Goes Home” initiatives, which we display in every fire station. The purpose of these initiatives is to reduce firefighter fatalities. Currently there are over 100 firefighter fatalities every year. The biggest contributor to the fatalities is heart attacks and apparatus collisions (15,000 a year nationwide). Firefighters are 100 times more likely to die from a heart attack than the general public. We do everything we can at East Pierce Fire and Rescue to support these initiatives and reduce firefighter injuries and fatalities. We are proud to have been nominated for the Seal of Excellence by the Region 10 FEMA Coordinator for our work in safety and support of the Everyone Goes Home Program.